A little over four years ago I took on a new challenge in the form of becoming a school governor. I've always seen good education as a fundamental part of a decent, happy and successful society and when I was told that Nonsuch Primary School (Chadacre Road, off Sparrow Farm Road - heading towards Stoneleigh) were looking for a new governor I decide to apply in order put my money where my mouth was - so to speak. 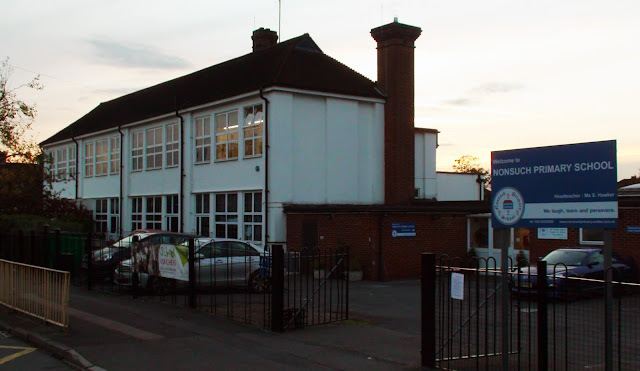 A few weeks after sending off the paperwork I was contacted and told that I had been successful and as of the 25th November 2011, I was officially a member of the Nonsuch Primary School Governing Body. I was invited to attend courses in governorship; I went and met the head teacher and several weeks later turned up slightly nervously to the next, and my first full Governing Body meeting. I needn't have been nervous as pretty much everyone else was there for the same reason - to help ensure the school does the very best it can for it's students. We would be best described as 'critical friends' of the school, working with the head teacher for the best possible outcomes for the school. It took a little time to get to know the systems but everyone's contribution was welcome from the start and straight away I was able to offer my views and support. I became the link governor for music and science (two subjects close to my heart) and was able to participate in music classes and the annual science week and report back to the governing body how well these things were going. These were perhaps some of the highlights of my governorship. Four years later, before November just gone, I decided not to seek re-election to the position. Having been elected chair of the Worcester Park Residents' Association in July I wanted to focus my efforts on the Worcester Park community a little more. Blog readers may have noticed a drop in bloging activity over the last several months which can only be put down to work, family and other such commitments and I felt it was time to do a smaller number of things better rather than spread myself too thinly. (I also stepped down as chair of the Friends Of The Daisy Field.) I have gained a great deal from my four years as a school governor and I hope that the school gained similarly from my input. Whilst Nonsuch Primary School recently took on two more excellent governors, they are still looking for some more people to complete the board, which is mainly why I'm posting this. Anyone of an altruistic nature with a passion for education should seriously consider becoming a school governor. Governors are volunteers and it is expected that they have full time jobs and family commitments so only a few hours are needed each month for evening meetings and few more in your own time to go through the policies and other paperwork that the governing body needs to scrutinise. One or two visits during school hours per term are also encouraged and many employers will give staff time off specifically for such community service. That is about all the time commitment that is required, but giving that little bit each, a good set of governors can make a huge difference to a school. I was glad to have worked at what is clearly an outstanding school and I'm glad to say that with the current board of governors and head teacher, I believe the school is in good hands. I would encourage anyone in the area who has ever entertained the thought of becoming a school governor to take the next step and find out more about it. You will need to be CRB checked but the school will help organise this. To take the next step, at least as far as Nonsuch Primary is concerned, please contact the school directly by emailing teachers@nonsuchprimary.sutton.sch.uk or by phoning 0208 393 9209. It is a wonderful way of giving something back to the community.